This article is from the Winter 2019 issue of History News, AASLH’s quarterly magazine. Members can access the full issue in the Resource Center. On the eve of America’s entry into World War II, Fajwal “Fred” Hendeles appeared with a broad smile and a dozen roses at the Kaiser shipyards in Richmond, California, seeking employment. Hendeles, a Jewish refugee from German-occupied Poland, had escaped a German forced labor camp, fleeing to Shanghai via the Soviet Union and Japan. On September 28, 1941, he boarded the S.S. President Pierce as a stowaway bound for San Francisco. The ship manifest listed Hendeles as an “indigent” with no passport or visa. He entered the country with support from the Hebrew Immigrant Aid Society and the Kaiser shipyards provided Hendeles with employment as a steamfitter. Two months later, the United States was at war. Hendeles’s story—uncovered by volunteers working with the Richmond Museum of History in Richmond, California—is one of many that have emerged from the nationwide “citizen history” project, History Unfolded: U.S. Newspapers and the Holocaust. 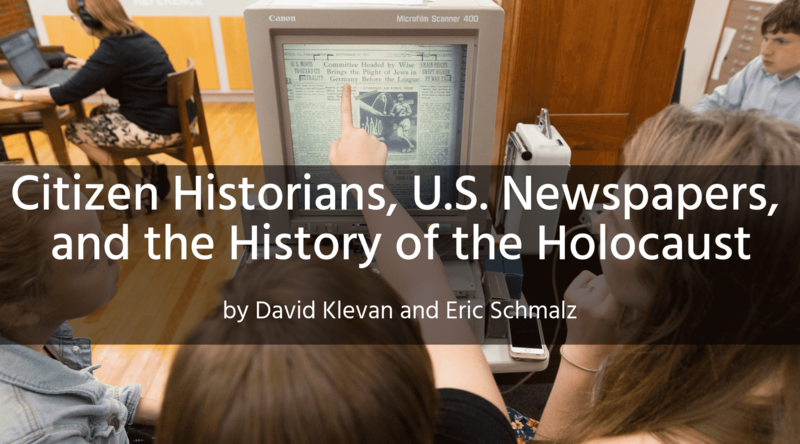 Publicly launched by the United States Holocaust Memorial Museum in early 2016, History Unfolded invites people across the country to research how their local newspapers reported on Holocaust-related events during the 1930s and 1940s. Project participants share their discoveries by uploading findings to a searchable online database. The museum has used this data to support exhibitions, educational resources and programs, and hopes it will be used to support future scholarship. The idea for History Unfolded emerged in 2014, when staff gathered to discuss the Holocaust Museum’s new initiative on Americans and the Holocaust. Like previous initiatives, Americans would include new scholarly research and a special exhibition, then scheduled to open in spring 2018. However, the small team gathered that day sought to inject something new. Rather than the museum performing research, mounting an exhibition, and then developing educational resources and programs, what if the museum asked schools and the public to perform research ahead of the exhibition launch—research that might help shape the exhibition and even future scholarship on the topic? What if the museum asked schools and the public to perform research ahead of the exhibition launch—research that might help shape the exhibition and even future scholarship on the topic? This approach was ambitious, but it made sense. An investigation of reporting by local newspapers in American communities had never before been pursued on this scale. It offered the museum a unique opportunity to investigate an otherwise distant and sometimes abstract “European” history of the Holocaust by making it American and local in a very concrete way. This would also allow the museum to engage learners in the discovery process, uncovering what information was available to members of their communities about the threat of Nazism and the Holocaust during the 1930s and 1940s. Thus, it could reinforce understanding that while the Holocaust took place in Europe, it was also an American story. As a participatory “citizen history” project of national scope, History Unfolded offered additional opportunities for the museum. First, because the museum itself does not house the newspaper collections used for this research, it was necessary to do research in the field. Second, the broad research scope and wide dispersal of sources would have made it difficult to do this without a crowdsourcing element. Third, and most importantly, the project offers an excellent opportunity for students and the broader public to learn about history by learning how to do primary source research. Because participants in History Unfolded learn while contributing to a large national effort on behalf of a trusted institution, they tend to express high degrees of commitment and self-motivation and appreciate the opportunity to do meaningful work. Therefore, museum staff viewed citizen history as a win-win. Participants could learn about the Holocaust while developing authentic research skills, a love of history, and a strengthened affinity for the museum and its mission. In turn, the museum would compile large quantities of data to help shape an exhibition, programs, and resources. In the process, the museum also would develop a dedicated corps of institutional stakeholders around the country. The Holocaust Museum’s decision to launch a large scale, multi-year citizen history project was not without risks and challenges. One key challenge was how best to help participants access widely dispersed collections, typically on microfilm and of varying quality. Unsurprisingly, a major determinant of the breadth and scope of newspaper articles submitted to History Unfolded from any particular state corresponds to whether the state’s historical newspaper collections have been digitized and are easily accessible online. However, most local newspaper collections from the 1930s and 1940s are available only on microfilm or in hard copy, and some collections are incomplete. Typically, the collections are housed in local or state libraries, university libraries, or historical societies. Therefore, the active participation of organizations housing the collections is critical to the project’s success. In addition, many citizen historians are not familiar with microfilm technology, and many young citizen historians are unfamiliar with print newspapers altogether. Therefore, the History Unfolded website provides participants with guidance on where to find print newspaper collections, how their information is organized, and how to use a microfilm reader. The project website also provides scaffolding for the research process itself, focusing the research of citizen historians. History Unfolded has identified more than thirty Holocaust-related events of specific interest to the museum for citizen historians to use as a guiding framework for research in their local newspapers. A short historical summary is provided for each event, as well as date ranges and keyword search suggestions. When citizen historians find an article, they are prompted to upload their finding, along with specific metadata such as page number, date, headline, and author. All submissions are reviewed by staff and volunteers, who frequently provide feedback to participants on their research. 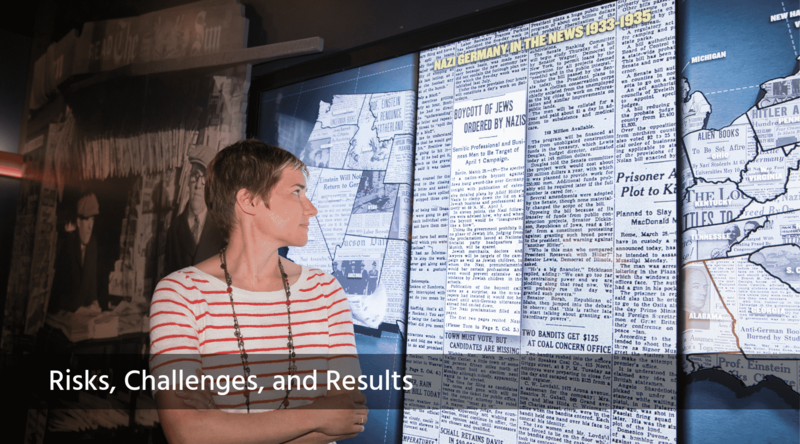 Despite the challenges associated with access to collections and learning how to perform research with historical newspapers, History Unfolded has enjoyed significant success. This is due largely to the museum’s willingness to dedicate staff and volunteers to engage project participants. The museum invested in a full-time community manager dedicated solely to the History Unfolded project. This fostered a regular flow of communication between citizen historians and the museum, enhanced participant engagement, and resulted in a high rate of retention. Educators whose students participate in the project tend to return with new classes year after year. History buffs, who contribute the bulk of submissions to the project, continue to participate months, or even years, later. When tasked with specific research assignments, such citizen historians typically respond with zeal and take pride in the museum’s reliance upon their participation. When tasked with specific research assignments, such citizen historians typically respond with zeal and take pride in the museum’s reliance upon their participation. In three years, over ten thousand individuals, one-fifth of whom are educators, have created accounts on the History Unfolded website. Roughly 30 percent of registrants have submitted data to the project, and as of September 2018, almost fifteen thousand articles from newspapers in all fifty states (plus Washington, D.C. and Puerto Rico) have been indexed in the project’s online database. The Holocaust Museum has organized community events called “research sprints” to focus citizen historians on the investigation of reporting about specific Holocaust-related events or newspapers from specific communities. Research sprints are organized events during which groups of citizen historians gather—sometimes in person at a library, archive, or historical society, other times virtually—to research one or more History Unfolded events in a specific collection of newspapers. Previous research sprints have generated content, such as letters-to-the-editor advocating for and against the Wagner-Rogers Bill of 1939, some of which appear in the museum’s special exhibition, Americans and the Holocaust, that opened in April 2018. Research by citizen historians has provided visual evidence that illustrates the context in which Americans learned about Nazi persecution and murder of European Jews. For example, major public events that shocked the conscience—such as the Nazi boycott of Jewish businesses in April 1933 and the Kristallnacht pogrom of November 1938—often were reported on front pages in communities large and small throughout the United States. These stories ran for several days or even weeks, but they did not appear in a vacuum. The Nazi boycott shared space on the front page with President Roosevelt’s order to cut veterans’ benefits, efforts to repeal Prohibition, New Deal projects, developments in the Scottsboro Boys case, and devastating storms that killed scores of people across the South. In many communities across the United States, information about the Holocaust was available, but it was not always prominent, and coverage was often ephemeral. Once America entered the war, the attention of Americans shifted, understandably, to the progress of the war. Indeed, after U.S. entry into the war in 1942, front pages were dominated by news related to the war effort. Stories about the Nazi plan to kill all Jews (the “Final Solution”) appeared in many American newspapers the day before Thanksgiving (November 25, 1942); the top story in many papers that day was that the Soviets finally had broken the siege at Stalingrad and nearly encircled the German army. The Allies’ public condemnation of the “Final Solution” appeared December 17, 1942, one week before Christmas. It was not uncommon to find these articles on interior pages of newspapers printed beside advertisements for turkeys and holiday sales. The History Unfolded project has helped both the museum and the public learn more about the specific contexts in which many Americans learned about the Holocaust and Nazism. There is still much to learn from History Unfolded. With a more comprehensive data set, staff at the museum look forward to analyzing and comparing coverage across communities—in university newspapers, Jewish and Catholic newspapers, African American newspapers, newspapers large and small, urban and rural. 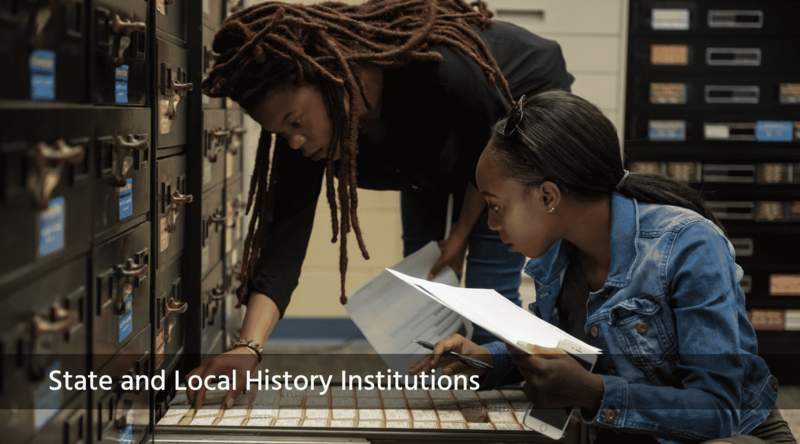 In addition to its broad appeal among educators, History Unfolded offers librarians, archivists, and staff at historical societies ample opportunities to meet their institutional objectives. Some of the most innovative approaches to and most exciting outcomes from the project have come from special programs in which libraries and historical societies have engaged staff and volunteers to investigate collections. Some of the most innovative approaches to and most exciting outcomes from the project have come from special programs in which libraries and historical societies have engaged staff and volunteers to investigate collections. Other institutions took different approaches to the project, but with similarly productive results. Jill Weiss Simins, a historian at the Indiana Historical Bureau, viewed participation in the project as an opportunity to “help make sure that the lessons and warnings of the Holocaust are not forgotten” and to “make Holocaust history more accessible [and] relevant to Hoosiers, who sometimes feel removed from national conversations.” Weiss Simins worked with intern Jenna Auber to upload content to the History Unfolded website, featuring their findings in the Hoosier State Chronicle blog. At the suggestion of the History Unfolded community manager Eric Schmalz, Weiss Simins and Auber recruited a small, highly engaged group of citizen historians from local universities for a research sprint to investigate Holocaust events in the two Indiana newspapers with the largest circulation in 1940 and upload entries for each to the History Unfolded database. Similarly, for Natasha Hollenbach, Digital Projects Librarian at the Montana Historical Society, History Unfolded offered a way to make her collections more visible and available to scholars. After first digitizing and uploading articles from the historical society collection, Hollenbach set up internal “research sprints” for her colleagues. She started small, asking for a few hours of staff time and maintaining a flexible schedule. Hollenbach made sure everyone knew they were welcome regardless of experience, both on the project and with the microfilm readers; this ensured a continuing number of new converts to the project and extended word of mouth advertising about how much fun it was. Through the staff sprints and Hollenbach’s individual contributions, the Montana Historical Society has uploaded hundreds of Montana newspaper articles. Participation by public history organizations has proven critical to the success of the History Unfolded project. Their ability to engage local communities in research, discovery, and learning has made significant contributions to the breadth and diversity of local reporting indexed in the museum’s database. Of equal importance, this participation has made local collections and local history more visible, and has allowed staff, volunteers, and members of the public to learn about their community’s role in Holocaust history. History Unfolded has demonstrated its potential as an engaging education tool that teaches valuable research skills and encourages critical thinking. 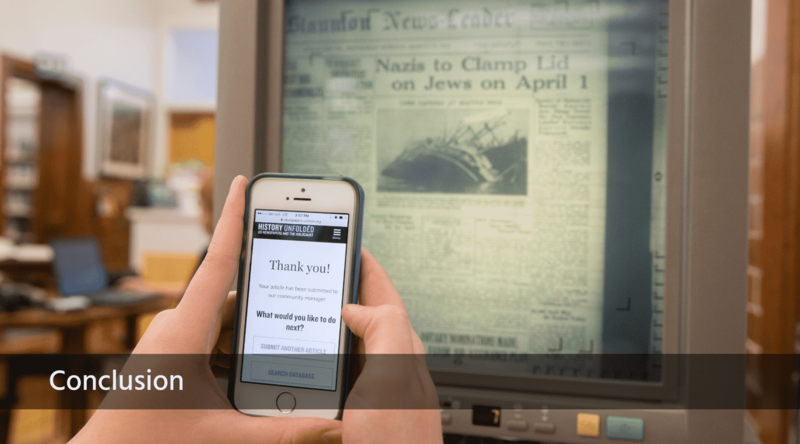 During the project’s first three years, the Holocaust Museum has indexed more than fifteen thousand entries for newspaper articles submitted by citizen historians across the country in a searchable online database. This can only be viewed as a major accomplishment and a successful beginning. However, half of these submissions came from newspapers published in only eight states (primarily in what today would be called “the Rust Belt”). For the project to function as a representative index of American news reporting, and to maximize its value for historical institutions and scholars, a consistent minimum data sample must be collected across all fifty states. In an effort to achieve this goal, the museum instructs participants to research newspaper reporting about a specific limited set of Holocaust-related events. It aims to compile a per state sample of at least one data submission for each Holocaust-related event for the two newspapers with the highest circulation in 1940. This should provide a minimum level of consistent data across states and allow for meaningful state-to-state comparisons of reporting at the time. The museum will continue to accept research submitted to History Unfolded through summer 2021.Therefore, libraries, archives, and historical societies have ample time to lend their expertise and ensure that their communities are represented in the project results. In 2021, the museum plans to shift the project focus from collecting new data to synthesizing and analyzing the compiled data. Correspondingly, the Holocaust Museum expects to provide tools that will allow citizen historians, Holocaust historians, and digital humanities scholars to filter, sort, and analyze the data in order to evaluate trends and anomalies and draw conclusions about this history based on the accumulated evidence. Though the Holocaust took place primarily in Europe, the research of citizen historians from around the United States makes clear that it is also an American story. It was told in front page headlines, editorials, letters-to-the-editor, and political cartoons of local newspapers from Richmond, California, to Helena, Montana, to Indianapolis, Indiana. By examining the information available to Americans, the stories we chose to tell, and the opinions we published, we learn as much about who we were as Americans as we do about how Americans responded to the Holocaust. David Klevan is Education Outreach Specialist in the Levine Institute for Holocaust Education at the United States Holocaust Memorial Museum where he develops educational resources and programs for a diverse group of audiences. Mr. Klevan specializes in experiential learning in online and digital learning environments. He earned his bachelor’s degree in Sociology at the University of Wisconsin-Madison (1990) and his master’s degree in Education at the Harvard Graduate School of Education (2004). Contact David at dklevan@ushmm.org. Eric Schmalz is the community manager for the History Unfolded project at the United States Holocaust Memorial Museum. He oversees the review of newspaper submissions to the project website, assists participants with their questions, and helps educators effectively incorporate History Unfolded into various learning environments. Mr. Schmalz specializes in developing and deepening authentic human connection through his work. He earned his bachelor’s degree in History at the College of William and Mary (2010) and his master’s degree in Teaching (Secondary Social Studies) at the University of Virginia (2011). Contact Eric at eschmalz@ushmm.org. There are several excellent examples of cultural institutions using crowdsourcing to transcribe and index historical documents. For example: “The World Memory Project,” US Holocaust Memorial Museum, accessed January 29, 2019, https://www.ushmm.org/online/world-memory-project/; “Transcription Center,” Smithsonian Instititution, accessed January 29, 2019, https://transcription.si.edu/; “Citizen Archivist Project,” National Archives and Records Administration, last reviewed November 7, 2018, https://www.archives.gov/citizen-archivist; and “Operation War Diary,” Imperial War Museum and National Archives, accessed January 29, 2019, https://www.operationwardiary.org/. Elissa Frankle, “Making History with the Masses: Citizen History and Racial Trust in Museums,” Digital Dialogues, Maryland Institute for Technology in the Humanities, April 4, 2013, https://mith.umd.edu/dialogues/making-history-with-the-masses-citizen-history-and-radical-trust-in-museums/. Fajwal “Fred” Hendeles became an American. He married, had children, and lived the rest of his life in California. He died at age 91 in Los Angeles.